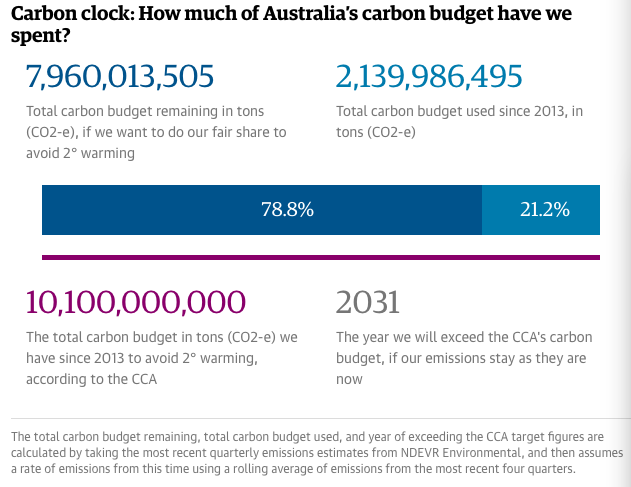 Australia has emitted about twice what is allowed by CCA’s carbon budget since 2013. In the three years and nine months to September 2016, the country emitted 19.8% of its share of what the world can emit between 2013 and 2050 if it intends to maintain a good chance of keeping warming to below 2C. If Australia continues to emit carbon pollution at the average rate of the past year, it will spend its entire carbon budget by 2031. Projected to the current second, the graphic shows how much of the carbon budget has been spent. The government has failed to report its emissions since the quarter ending December 2015. Last year it released data on Christmas Eve, when it reported a jump in emissions. This entry was posted in Events local and tagged carbon budget, climate emergency declaration. Bookmark the permalink.